Today I had a meeting with both the COO and CIO of Discovery Health. 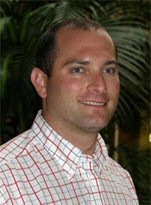 Heady stuff, except that the COO, Dr Ryan Noach, has the "bedside manner" of earthmoving equipment. It's not often that I get lectured to for interrupting. He clearly hasn't lost the "God Complex" that afflicts many doctors. When I pointed out that as far as I was concerned, Discovery Health was a financial services provider, whose job it was to process my medical aid claims, he denied this. Discovery Health, it seems, has delusions of grandeur: they are now a company that provides an online Electronic Health Record (EHR) to unspecified healthcare providers. And its amazing how evasive he got when I asked for more specific details: My GP can access the scheme, but not my Dentist. What about my Cardiologist? They changed the subject. 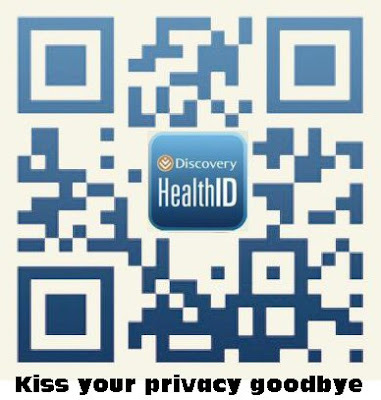 Discovery takes all reasonable steps to protect personal information and maintain confidentiality. By signing below, I give Discovery Health (Pty) Ltd and my medical scheme, being a medical scheme administered by Discovery Health (Pty) Ltd (“Scheme”), permission to release my Electronic Health Record (EHR) to my healthcare provider. This includes details about chronic condition(s), benefit plan details, certain biographical data and pathology and radiology results. This may include information related to HIV/Aids. I understand that once Discovery Health (Pty) Ltd and the Scheme have handed my records to the healthcare provider, they have no further control over this information and that they will not be accountable for the safeguarding of this information. I do understand that the healthcare provider has confirmed to Discovery Health (Pty) Ltd that he/she will treat my health records as confidential and in line with the relevant legislation. I agree that by making this information available, Discovery Health (Pty) Ltd and the Scheme are not responsible for any loss (whether direct or indirect) that may arise from the use of this information. I agree that I may not hold Discovery Health (Pty) Ltd or the Scheme responsible for any loss that may result from the incorrect use or disclosure of the information by my healthcare provider. So in spite of assurances from the very top that the HealthId iPad app is "secure", the first thing you have to sign is a waiver that says that Discovery is irresponsible not responsible. Most lawyers call this a "Consent and Waiver" agreement. Discovery's BS marketing department leaves out the "waiver" part. We don't want to startle the animals. Dr Noach asserted that Discovery was "willing to listen" to my concerns, but "would take [my] suggestions under advisement". After all, they are only my opinion, and other people have other opinions. (Did someone say "God Complex"? Maybe he was just playing the "bad cop" role. Who knows, but it certainly didn't come across as sympathetic, just arrogant.) I pointed out that the Discovery web site allows me to choose "passw0rd" as a password without even the slightest hint that it is completely insecure. I mentioned the web site "how secure is my password" for some code on how to warn users of insecure passwords. In the past the Discovery web site only displayed claim details, without stating the medication being claimed for. 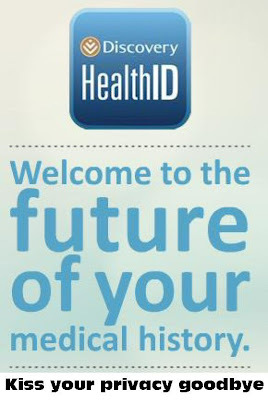 Now it contains a full Electronic Health Record and Medical History. I hope they will take this suggestion seriously, and also warn users not to use the same password that they use anywhere else. When I said that I wanted two-factor authentication, they came up with a whole bunch of excuses about why this was "impractical". "We deal with very old and very sick patients who don't have cell phones". This is the reason why they can't send an authentication code as part of the "consent and waiver" process. But in the same breath, I'm assured that this process is secure because the moment I sign the "consent" form, I'll receive both an SMS telling me the dirty deed is done, as well as an email with a copy of the "signature" provided. (I'm not sure how the elderly and very sick check their emails). But now that the horse has already bolted, I can always phone their call centre or log on to the web site to cancel the "consent". I pointed out that this wasn't always practical: the call centre isn't always open, for starters. "If I'm in Antarctica should I worry about this as well" was Dr Noach's sarcastic response. So much for "listening". WTF? Despite that, they are working on some unspecified cell phone authentication process. In a month's time the iPad app will get an independent security audit from KPMG. These are the same people who verified that the Discovery web site as being "secure" 3 months ago. They got very defensive when I said that I didn't think they were taking security seriously: I pointed out that they have rolled out the HealthID program to over 400 doctors and just sent out an email to all their members extolling its virtues, in spite of my security concerns and the Noseweek article. Dr Noach doesn't think much of my blog or Noseweek. He's happy to listen to KPMG's experts instead. These are the same experts who didn't check for "passw0rd". I have subsequently received details from Vladi Belev (Enterprise Architect at Discovery Health) of the multiple security measures in place on their systems. It is reassuring to know that at least their IT division takes enterprise security seriously. On a more bizarre note, we had a brief discussion of how there is basically no privacy left in the medical industry. In other parts of the world, doctors regard EHR as a right, not a privilege. Patients basically are expected to sign away their privacy to anyone godlike enough to call himself a doctor. Discovery Health has clearly embraced this model. When I asked them "When did I give you permission to make this information available online?" The reply was: when you sign the "consent". That's another way of saying "No, you haven't given us permission yet, but you will." So when their catchy PR email says: "HealthID: The technology that puts your health records in your doctor's hands" they don't mean that he can hold the iPad in his hands. They mean that they will happily make the doctor responsible for the security of the private, sensitive data they have collected, whether he has the expertise to do so or not. One important concession I obtained: they agreed to remove my medical history from their web site. This isn't available for everyone (yet), only if you kick up enough fuss. Phone their call centre and ask for it to be done. If they refuse, or duck and dive, then ask to be put through to the COO. And be sure to ask for the name of the luckless call centre agent who refuses, and note the time of your call. 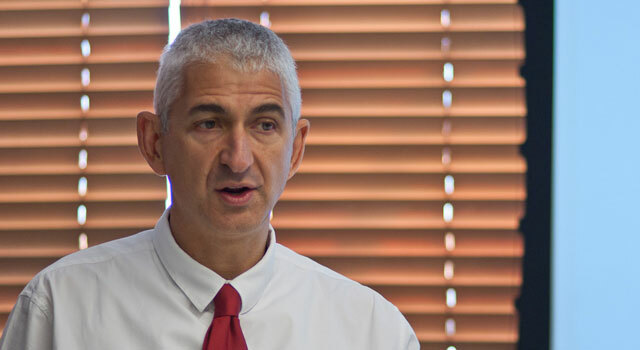 Update: ITWeb has an article that explains how your Vitality info, pathology results and other info will be made available to doctors, hospitals and emergency personnel. Broomberg says Discovery was concerned with the growing problems of fragmentation between all the role players within the health system. “Doctors, hospitals, pathology and radiology are all separate practices, and this results in lack of co-ordination, and limited or no sharing of critical health information that would enable doctors to make more informed decisions or reduce inefficiency in the system,” he explains. Emergency personnel will scan a QR Code on a car sticker Or other location to access your data. How secure is that going to be? The mind boggles. According to IOL, they will pay doctors to use the app. Once the patient reads the consent waiver and agrees to allow the doctor access to their medical records, they can no longer withhold that information from the doctor. It is an all or nothing deal, though Discovery Health may be developing limiting tools in the future. Doctors use the app at no extra cost to them or their patients. In fact, doctors can earn an additional R15 per consult if they use the app for 50 percent of their Discovery Health consultations daily. Update: Wednesday 15 Aug: Dr Noach refuses to provide me with the contact details of the KPMG people who did the web site security audit. All I wanted to ask them was why they didn't check for insecure passwords, like "passw0rd". Discovery has clarified that the "consent" is doctor-specific, not practice specific. That means if a doctor leaves a practice he can take all "his" patients' electronic records with him. I wonder what the other doctors will think of that? Will they know? If the doctor now gets a job at Discovery Life, will they use the information to adjust the policies of those patients? Some relevant Security Maxims: So We’re In Agreement Maxim: If you’re happy with your security, so are the bad guys. Big Heads Maxim: The farther up the chain of command a (non-security) manager can be found, the more likely he or she thinks that (1) they understand security and (2) security is easy. Huh Maxim: When a (non-security) senior manager, bureaucrat, or government official talks publicly about security, he or she will usually say something stupid, unrealistic, inaccurate, and/or naïve. Naturally, I was annoyed because they "know" I'm a homeowner, which is none of their business, and they found out my cell phone number by some devious, unethical or illegal means. So I replied "YES" to get them to call me and explain where they got my details from. The lady from the call centre called me and asked for my wife. I asked what it was in connection with, and she referred to the SMS. I told her it was my phone she had called, and she said they knew my number because I own property. I asked if they were members of the Direct Marketing Association. She said no; she either lied or didn't know. Direct Axis Sa (Pty) Ltd is a member of the DMA. So told her to put my number on their Do Not Contact database, and told her I don't trust and won't do business with companies who go scurrying around trying to find my details without my permission. I received an unsolicited SMS message from your company today, touting your 1HOME product, whatever that is. Are you not aware that my name and number is on the DMA’s Do Not Contact list? I will check on why you received the promotion and revert[sic]** to you. I can confirm that we are in fact a member of the DMA and that we definitely would not have got your details from your blog. The guy looking after the 1Home marketing is currently looking into the detail of exactly where your details where obtained and why you received a promotion. I will have this feedback for you by the close of business tomorrow as today is a public holiday. So now we have a registered Financial Services Provider ignoring the Do Not Contact list of the DMA to send me spam. That's already a violation of the ECT Act, and probably the Consumer Protection Act as well. 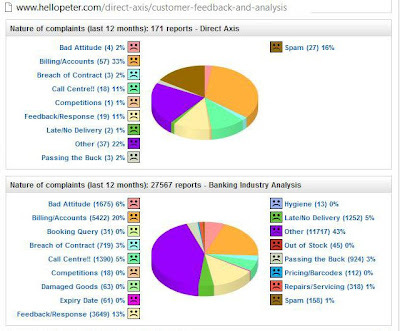 Note how the industry average for spam complaints is around 2%, yet DirectAxis is 16% (8 times greater). 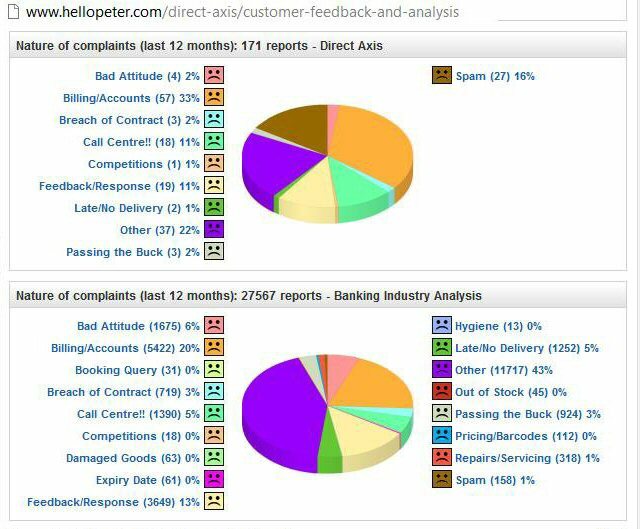 A browse through their list of complaints found several recent spam complaints among dozens of complaints about bad Billing/Accounts. Just as I suspected: not particularly trustworthy, especially with my data. Update: *Loans from Sanlam Personal Loans are administered and managed by DirectAxis, an authorised Financial Services Provider. Sanlam Personal Loans (Pty) Ltd Reg. No. 2001/016316/07, Registered Credit Provider (NCRCP272), is a joint venture between Sanlam Life Insurance Ltd and Direct Axis (SA) (Pty) Ltd. Reg. No. 1995/06077/07. **On the subject of the usage of the word "revert": look it up, and you will find it means "to come or go back (as to a former condition, period, or subject)". So to say you will "revert to me" means that you will go back (regress?) to being me, which is insulting. It's almost as meaningless as "get back to me" when what you mean to say is "reply" or "respond" or "answer". Our 1Home offering is focussed on providing home owners with value by offering personal loans for home improvements. Your details were included on the database of a company called Journey (they have associations with companies which have assisted people obtain home loans or enquire about home loan finance), who provide us with services for our 1Home offering. As a result of a technical issue our routine daily check against the DMA opt-out records did not run on Wednesday. This is the reason that you were contacted despite being on the DMA's list. This technical issue has been resolved and you will no longer receive messages from us. Your records have been removed from the Journey database. We have identified the call center agent who incorrectly informed you that we are not members of the DMA and we have ensured that this will not occur again in the future. I trust the above gives you the clarity you require and apologise sincerely for any inconvenience. I would be very happy to discuss this matter further with you should you require further information. How convenient to be able to blame it on a technical issue. I believe that as much as I believe the sincerity of the apology, given their track record on HelloPeter. It would appear that the "Journey" company mentioned in the reply is also a member of the DMA: Journey Customer Innovation Pty Ltd. So now we have two companies, both members of the DMA, ignoring the Do Not Contact database and spamming potential customers. How dumb is that?Also, none of this claptrap about "associations with companies which have assisted people obtain home loans or enquire about home loan finance" explains how they as a Financial Services Provider could abuse this information in such a way. It just doesn't sound ethical to me. But then I've yet to meet an ethical spammer. I no longer trust Discovery Heath with any of my medical information. As far as I'm concerned they are merely a financial institution, about as trustworthy as my bank manager. And I don't discuss my medical conditions with him either. Discovery knows far too much about me already: where I live, how often I go to the gym, what foods I eat, which doctors I see, and what pills I'm taking. 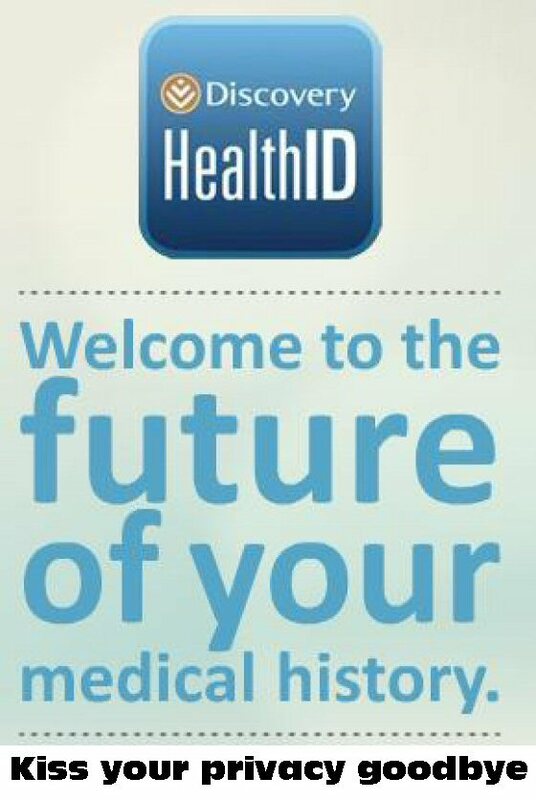 Now through their hair-brained scheme called "HealthId" they want to make this available to anyone in the health care industry who has an iPad and can forge my signature or convince Discovery that I gave my consent. So my dentist can find out whether I've seen a marriage counsellor and whether I take Viagra or not. My heart doctor can find out how often I get my eyes tested. My GP can see how many times I've been tested for HIV. What's to stop my life insurance company from getting this information, either legally or illegally? Once it's available in a neatly collated form on an iPad, who says a snooper can't just "borrow" an iPad and look up all the details on file and sell it to any number of interested parties, like life insurance companies, say. There is no facility on the Discovery web site that allows me to pre-emptively block access to this data. There should be. And I'm pretty sure that the iPad software can't be disabled if an iPad is lost or stolen. Discovery can't even tell me what information they are going to tell the doctors, or whether doctors, dentists, optometrists and so on get the same information or different information. I don't think they have given it any thought at all, quite frankly. Which is more alarming than the fact of them even thinking of making this information available. Another point is what Discovery plans to do with the Doctor's notes and other information captured on the iPad software. Are they going to read the notes to try to second-guess a recommendation for Chronic medication benefits? Are they going to bump up my premiums based on what my GP has written in his files? What's to stop a hacker reverse-engineering the iPad app and figuring out how to send the "consent" permission to the Discovery servers to get the records of hundreds, if not thousands, of patients? Since there is nothing on the Discovery servers to pre-emptively block them from doing so, Discovery is effectively trusting every iPad out there, without knowing who is using it or what their intentions are. Since iPads can't do biometric identification (thumb prints or retina scans), they have no way of knowing who is using it. Bad move. I will call. But it's important to know that your data is blocked by default. No doctor can access your data unless you personally and explicitly give permission. This permission can be given for named doctors or for all doctors you see. It can be withdrawn at any time. If you choose not to give the consent, your data remains entirely private. Does this address your concern? This is very worrying. I have explained to him that not having a pre-emptive blocking option is different from what the system does now. Hopefully he will get it, because he doesn't seem to understand the difference yet. Every time I log in to Discovery.co.za I want an email notification of my login, exactly like FNB does. I want to see a list of the date and time of the last 5 logins on the opening screen after login. Just like FNB does. When I go to the HealthID Consent Manager on their web site, at present I can select "I agree to the terms and conditions". I want a further option that says "I do NOT agree to the terms and conditions, and wish to keep my electronic medical history private"
I want this option enabled by default. In order for the doctor to obtain my consent, I type my Discovery user name and password to the iPad app. Then Discovery sends an SMS to my phone with an authorisation code. I then fill in the code into the app to allow that particular doctor access. FNB does something similar on their banking site with particular transactions. On subsequent visits to the doctor, Discovery will SMS me an authorisation code that I then give to the doctor so he can view my profile for the rest of that day. Like Dr Moodley at Stellenbosh University, I think the privacy issues and disclosure issues need to be addressed. But until the security concerns are addressed, there isn't much point. I would also like Discovery to warn users not to use the same password that they use on other sites. This is responsible security practice. Right now they don't even warn you if you have a weak password. 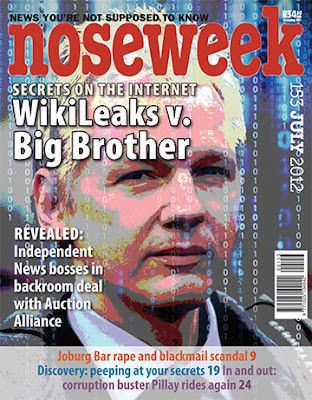 They allowed me to choose "passw0rd" for their site. What were they thinking? "P.S. Discovery HealthID was awarded best iOS app for enterprise at MTN’s first ever app of the year awards." They obviously didn't do a security audit of the app. Neither has Discovery Health.